Artists occasionally find themselves figuring out all the possible ways they might do something, or arrange certain basic materials; and instead of choosing one they judge to be the “best”, sometimes they choose to show us all of them, like a sort of catalogue. The viewer is then invited to look at (and perhaps explore) the space of all possibilities. On the left is a deceptively simple example, a sculpture by Belgian artist Pol Bury in the Tate’s collection. Can you figure out the rule Bury used to create this piece? How much has been decided by the artist and what’s purely mathematical? 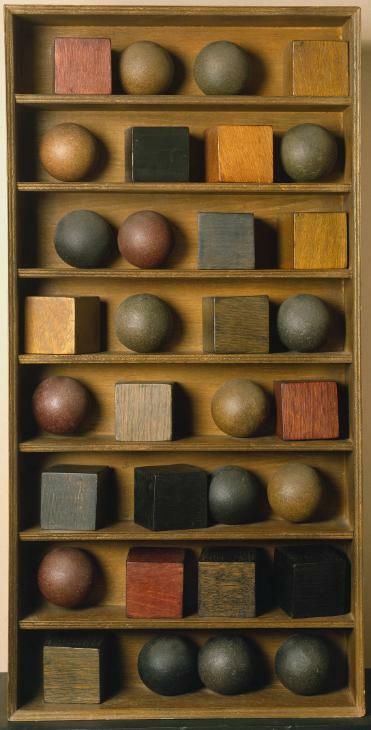 If Bury had used three shapes — say, a ball, a cube and a pyramid — how many shelves would have been needed and what would go on each one? To answer these questions you need a grasp of the maths involved, although you don’t have to do any calculations; playing around with pen and paper will get the job done. You also have to make some more conventionally “artistic” decisions; Bury chooses not to include all the possibilities in his work and you might like to think about why that could be.We encourage you to try to answer these kinds of questions by drawing and pattern-making, as Numberphile suggests (this is related). If you’d like to learn a bit more about how to do these with numbers, though, have a look at this video to get you started.